Saul Albert has a terrific blog of his own, but has also been part of a lively and committed team setting up and curating the indispensable EM/CA wiki. Here he explains its genesis and its ambitions. 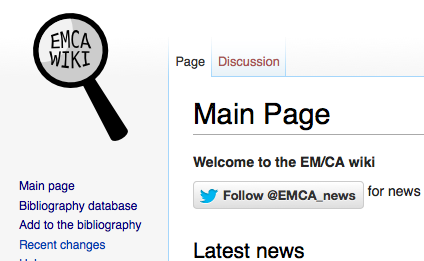 The EM/CA wiki (http://emcawiki.net) is a wiki bibliography and information repository for Ethnomethodology and Conversation Analysis and has been running since July 2014. This guest blog post aims to give readers a little background on the site and what I learned from setting it up. 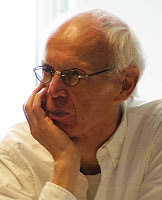 The first thing to say about the EM/CA wiki is that it is by no means an individual project, and only exists because of the long and dedicated work of Paul ten Have setting up and running his Ethno/CA News site from 1996-2014. During that time Paul published tens of thousands of EM/CA bibliography entries along with a treasure trove of useful information and links assembled at a time before there were as many primers in EM/CA methods for students and researchers. In early 2014 Paul asked for help with the site with a view to turning it into a long-term collective effort and I volunteered. Paul gathered a small group of researchers including myself, Elliott Hoey (MPI Nijmegen), Mea Popovicui (Loughborough), Edward Holmes (York), and Joshua Raclaw (Wisconsin) and assigned us all journals or publishers to check monthly for EM/CA-relevant papers. Each month we would email Paul our findings and he would check them, send us useful comments on our finds, and add them to the bibliography. We had some fascinating discussions during this process, most interesting and educational for me were our deliberations about what should count as an EM/CA paper. I was initially surprised about how contentious this issue could be. As a graduate student reading my way in to the EM/CA literature, I found a tremendous diversity in approach and in the areas of study dealt with by EM/CA researchers. I could also see that the field in general had the character of a tight-knit, embattled community with stronger guiding principles and research practices than internal divisions. What should go in – and what should not? For years Paul had been open minded and thoughtful about each bibliography entry – maintaining a balance between different approaches and trends. As he broadened the editorial team, and was dealing with so many more publishers and researchers producing EM/CA publications in more and more outlets, this became a more complicated issue. Some of our early discussions tried to fix on specific criteria e.g. : the paper should explicitly reference some branch of ethnomethodological work, or it should present data with sufficiently detailed transcriptions to allow readers to check the findings, etc. etc. However, we realised that this was an inadequate approach because some papers might be wholly theoretical but deal with EM/CA as a methodology, or might build on entirely different areas of research but foreground significant amounts of EM/CA empirical work in the write-up. In the end, we decided that the only relevant criteria were whether the authors themselves described the paper as centrally relevant to EM/CA, and whether this description stood up to deliberation. The obvious solution was to set up a wiki where that deliberation could happen transparently by researchers adding, discussing and editing entries (just as they do on Wikipedia), and where more researchers could become involved in the editorial process. After a discussion at ICCA 2014 at UCLA, I set up the wiki and Paul’s group of helpers, joined by Clair-Antoine Veyrier (from Telecom ParisTech) became the EMCA Wiki Admin group and began adding bibliography entries from the original list of over 20,000. In October 2014 Paul stepped down as editor of the original EM/CA news site, and joined the group to continue adding new entries, as well as overseeing and guiding the transition of the original bibliographies to the wiki. 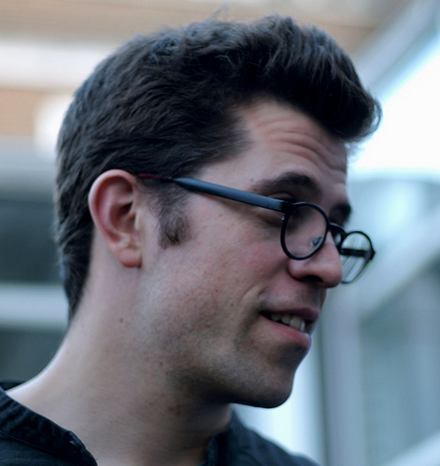 In early 2015 the board of the International Society for Conversation Analysis (ISCA) decided to support the continuation of Paul’s work as a long-term project by setting up an editorial board, supplying server hosting and hiring Darcey Searles (Rutgers) as an RA to help with digitising Paul’s original bibliographies. For me this process has shown me the strength of the EM/CA community: Paul’s amazing work being picked up and continued by a group of volunteers from different fields and institutions, and then ISCA stepping in and providing for its long-term sustainability. The slow work of adding hundreds of bibliography entries has also provided me with an absolutely fascinating tour through the history and diversity of EM/CA work paper-by-paper. I became addicted to checking the ‘recent changes’ page of the wiki to see which papers our team were adding to the bibliography, and eventually set up a EMCAwiki Twitter bot that tweets every time a new paper is added. There have been some other interesting and promising side-effects of digitising the bibliographies. One of my favourites is looking at the kinds of EM/CA-related keywords that researchers and contributors to the wiki have used to categorise bibliography entries. At some stage this will become a really useful overview of the kinds of issues covered by the field, and we can start doing data visualisation of changing topics, authors, journals, and trends in the field over time. More generally, I hope that the EM/CA wiki will become useful in the ways wikis were first intended to be used by their programmers and editors: to store and share information derived from otherwise fleeting forms of electronic communication. We already do this by gathering tip-offs, trawling relevant websites, blogs, facebook groups, mailing lists and twitter feeds for conferences, job postings, workshops, CFPs etc. then we compile them into a news feed on our front page, a conferences page, our Ethno/CA News twitter feed and a number of other resource pages on the wiki. As well as hosting and updating Paul’s original EM/CA resource pages, the wiki also provides a way to document some of the excellent discussions that take place on the Languse mailing list. For example, the recent discussion thread on funny videos that can help to explain CA concepts was excellent wiki-fodder. Similarly, Ruth Parry’s comprehensive list of data collection technology, camera equipment and transcription software makes a much better wiki page than it does a print publication given how often these things change. 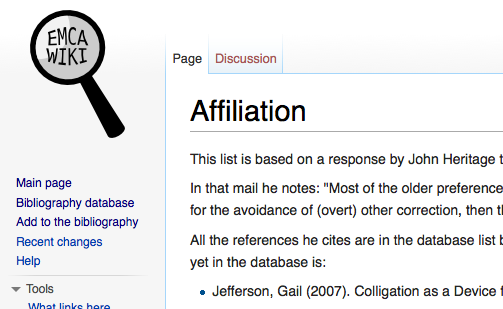 More specific to the bibliographical functions of the wiki, a recent discussion on affiliation yielded some great suggestions, which we quickly compiled into a topical bibliography page for affiliation. In future versions of the wiki, each keyword will have this kind of topical bibliography, just as each author will have an author-specific page (e.g. http://emcawiki.net/Charles_Antaki) listing as many of their EM/CA-related publications as we can find. While continuing to expand the bibliography, the next version of the EM/CA wiki will focus on improving how we deal with time-sensitive information like news items, job ads, CFPs and conferences, as well as other more substantial information resources and how-to guides. If you value this kind of information resource, and would like to help contribute to it, we are always looking for new contributors and maintainers, especially people who can contribute non-English language bibliography entries and materials. If you have some information you would like listed, or can help with this, please get in touch with admins@emcawiki.net.